Rating based on 52+ users per month. How to convert PDF to Word on Mac is a too often heard topic. There are so many solutions or software offered to change PDF to Word Docx for free or with high quality. To help you find the most suitable solution, we here list 8 ways to convert PDF to Word on mac. Download the free trial of PDF Converter OCR, install and launch it. Drag and drop PDF files into the program. Specify the PDF pages you want to save as Word, and select output as Doc or Docx. Click "Convert“ to change PDF to Word on Mac. Part 1. How to Convert PDF to Word on Mac Using Preview (Free)? Automator allows users to create workflows for automating tasks, it can help save time and efforts on manually changing each file. With Automator, Mac users can extract PDF text, then open text file in Word, and finally save PDF as Word on mac. Open the text file with Word, and your PDF is converted to Word on mac now. As a PDF user, Adobe should sound quite familiar to you. If you have installed and subscribed Adobe Acrobat, you can export PDF files to Word format on your mac with Adobe. Since there are several versions of Adobe Acrobat, the steps to export PDF as Word will be a little different when using different Adobe versions. No worries, we have the answers as following. Step 1. Open PDF with Adobe Acrobat DC. Step 2. Go to Tools>Export PDF. Step 3. Choose Word as output, then click “Export”, the PDF will be converted as Word format on mac. Step 1: Open the PDF in Adobe Acrobat for conversion. Step 2: Click the "File" option on the top navigation bar of Adobe Acrobat. Step 3: Choose "Save As Other" from the menu. Step 4: Select output as "Microsoft Word" to convert PDF to Word on mac. Step 5: (Optional) Type a name for the document, then click the "Save" button. 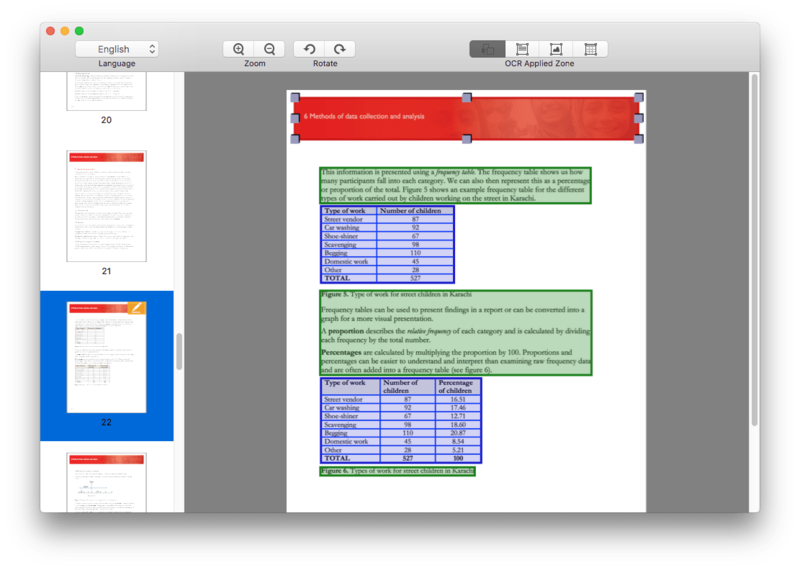 If your PDF is scanned, try to perform Adobe OCR and save them into Word on mac. Extended: Can Acrobat Reader Convert PDF to Word on Mac? Acrobat Reader is totally free of charge for all Mac users. You can view, print, comment and share PDF file via it. But unfortunately, it only supports the basic reading features. You can’t create PDF, edit PDF, or even export PDF to Office format. However, same as Mac Preview---the free PDF reader to view PDF files on mac, Adobe Reader also allows users to copy and paste the PDF texts into Word or other text processors, only if the file is native, instead of image or scanned ones. People always return to online free PDF to Word converters for convenience and free of charge. These tools are genuinely recommended if you are working on simple and native PDFs. After uploading and testing files on dozens of online conversion tools, here we list following 3 best free PDF to Word converters for your choice. It allows users to upload PDF files from mac, Dropbox or Google Drive for Word conversion. It supports native PDFs only and there is file size/quantity limit. Click the download link to download converted file in Word format. Google provides an online platform for users to manage their documents---Google Docs. In Google Docs, you can open PDFs and download the file in Word or other editable formats. Go to File>Download as>Word. Your PDF will be converted into Word on mac. It allows users to convert both native and scanned PDFs to Word online without 3rd party software installed. Even, you can customize your Word output a little by using this free PDF to Word converter. Click “Convert” to turn PDF into Word online. Also, you can use the preference tools to customize your Word output before conversion. Another workaround to save PDF as Word format on Mac is directly open or edit the PDF file in Word, then perform “Save as”. But how? It is lucky that Microsoft Office 2016 for Mac is built in such a feature, if you have installed MS Word 2016 on your mac, open or edit PDF in Word now. Yes, there are so many choices to convert PDF to Word on mac, but what is the best PDF to Word converter for mac to get high quality conversion result? According to users, Cisdem PDF Converter OCR is picked as the best PDF to Word converter for mac, because it meets all users’ needs to convert a PDF or other documents. Why Cisdem PDF Converter OCR? Cisdem PDF Converter OCR is the mac program designed to convert PDF files into various formats for easy editing, reading and management. There are basically 3 types of PDF that we need to deal with very often: native, scanned or protected PDF. Unlike most of its competitors, Cisdem PDF Converter OCR is one among few programs to support all types of PDF files. That’s to say, you can not only convert normal/native PDFs to editable Word on mac, but also can save scanned, image-based even locked PDFs into other formats with equally easy steps. You may need to convert these PDF to more than just Word format. To make full use of the existing PDF resources, sometimes you still need to convert PDF to Excel, HTML, or Pages, etc. 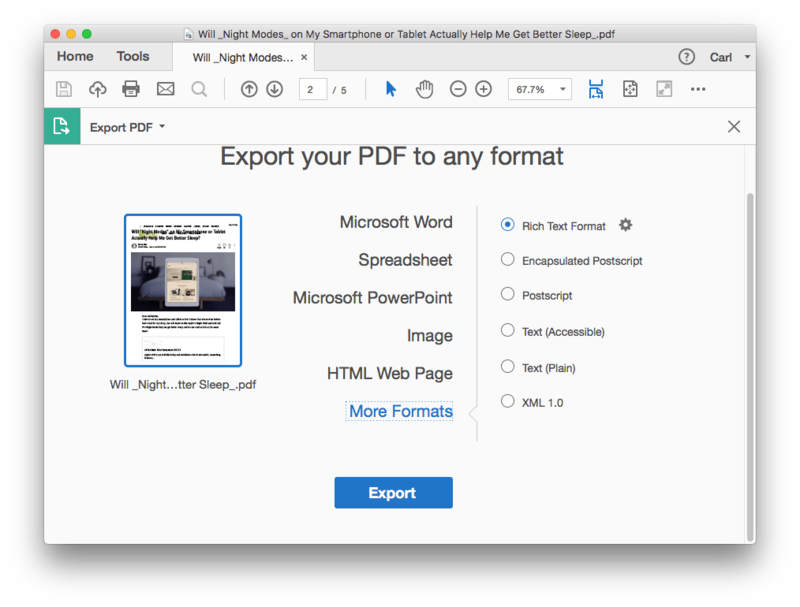 No worries, Cisdem PDF Converter OCR supports to export as total 16 formats, including virtually all formats you will need to deal with very often, such as Word, Excel, PowerPoint, ePub, Pages, Keynote, HTML, Text, etc. To convert PDF to Word on mac with high quality, the PDF converter should maintain the original formatting, layout and resolution as highly as possible. Cisdem PDF Converter OCR can yield first-class conversion quality by keeping the original layout, font effects, tables with cell spacing, frame footnotes, PDF active elements, image resolution and can recognizing special symbols. OCR can never be perfect, but Cisdem PDF Converter OCR does outstandingly. It is designed to accurately recognize texts and contents from image-based files, also, it builds in an OCR mark tool to improve the accuracy further. With this advanced tool, users can choose to OCR and export a specific area as Text, table or image. Allowing Save Files as PDF. Not only exporting PDF as Word other formats, Cisdem PDF Converter OCR also allows users to save Word, PowerPoint, Image, ePub and so on as PDF format, with original file quality highly retained. You can convert single or multiple PDFs at the same time to earn more time for your purpose. No matter how many files or how large the file is, Cisdem PDF Converter can upload and process fast to get you the output as expect. Since Cisdem PDF Converter OCR supports native, scanned and protected PDFs, the steps may be a little different and here we offer 3 tutorials as following to help you do the conversion fast and easily with Cisdem. #1 How to Convert Native PDF to Word on Mac? Step 1Import PDF for Conversion. Drag and drop the PDF file to the interface of the "Converter" or you can add by clicking the "+" icon at the bottom of the program. Step 2Choose Page Range and Output as Word. You can choose to convert all pages or convert specified pages by filling in the page range. Also, choose Word Doc or Docx as output from the output menu. 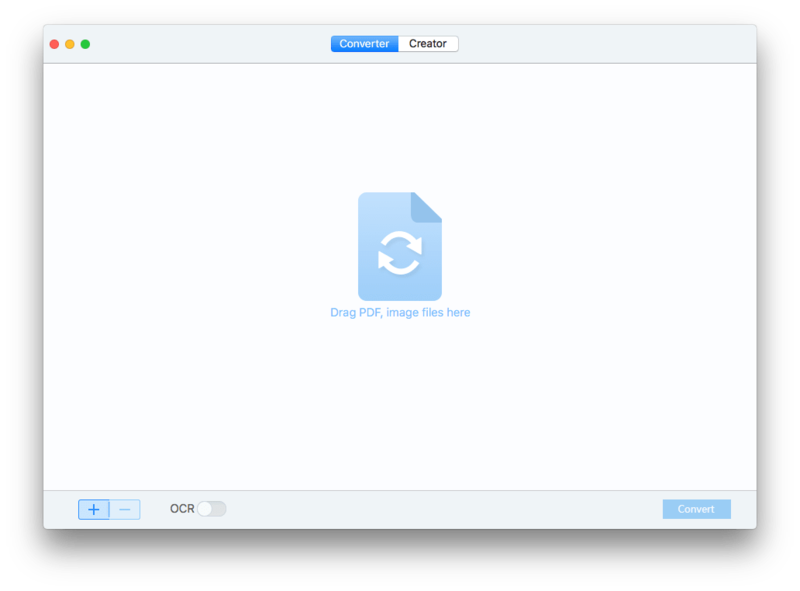 Step 3Click “Convert” to save PDF as Word on mac. You will find the Word output looks exactly the same as original PDF file. #2 How to Convert Scanned PDF to Word on Mac? Step 1Upload PDF for Conversion. Drag and drop the PDF file to "Converter" or click the "+" icon at the bottom of the program. Step 2Choose Page Range and File language. Cisdem supports to recognize 27~200 languages, you need to choose the file language first, then select pages for conversion. Step 3(Optional) Use Advanced Settings to get more accurate OCR results. Click the settings icon besides the langue button, then an interface with OCR applied zone appears. You will find all the contents are auto marked as texts, images or tables in different colors. For illustration, if you want to export a specific area as text, click on “Mark Texts” in the OCR applied zone, then drag a mark box to include the contents you want to mark as texts. Step 4Click “Convert” to export scanned PDF as Word on mac. #3 How to Convert Protect PDF to Word on Mac? Drag and drop the PDF file or click the "+" icon at the bottom of the program to upload files. Step 2Unlock PDF for PDF to Word conversion. If your PDF file is protected with an owner/permission password only, Cisdem can remove the PDF protection directly and allows conversion, if there is a user/open password locking your PDF, there will be a lock icon as following, you need to click on the lock icon and enter the password, if you forgot, try the Cisdem solution. Step 3Choose Page Range and Output as Word. If you are working on scaned PDF, use the Advanced OCR tool if necessary. Step 4Click “Convert” to convert protected PDF to Word on mac. For More PDF to Word Converter? Word, the abbreviation of Microsoft Word or MS-WORD created by company Microsoft, is a graphical word processing program enables users to type with. It allows the users to type and save documents. The Word can be outputted in Doc or Docx format. Doc is a binary file format system which can save the formatted text, images, graphs and page, it is the older format used in MS Word 2003 and earlier version. While Docx is a XML format that can coordinate between different Office programs, it is the default format used in Word 2007 and later version. The Difference Between Doc and Docx. Docx is more powerful and versatile on features. It seems that Docx is a better output format. So, for your convenience, you are recommended to convert your PDFs into Docx. There must be more methods to convert PDF to Word on mac, direct or indirect, free or paid. Like any other users, you may hold more preferences to solutions that can bring high quality conversion results, also can greatly save our time and work. Why not have a try on PDF Converter OCR, the one kills all problems on PDF to Word conversion on mac. What is the Best PDF to Word Converter for 2018 (Download Address Included)? Converting PDF to Word is more like a routine work now and we return to the best PDF to Word Converter for help. But, how many times have you been fooled by those advertisers with their bragging and exaggeration? No wrong decision anymore, here we will show you the step-by-step testing credentials on several top PDF to Word converters and bring you to the best one. Several free pdf to word converters are listed here, each one stands out one way or another, users can choose their favorite to convert their pdfs to word for free. Want to make changes on a PDF without going back to the original document? Use the online pdf to word converter, free and convenient, to make it. Thanks for the informative sharing. I used to use Adobe on my old Mac, but now I am using Cisdem PDF Converter OCR on my new macbook air, it affordable to me and works well so far, almost all the conversion preserved the layout as original, except some complex text. Good work! nice converter!!! the exported word is VERY NICE. I have compared with other converters. As this one is cheaper, i decide to make a free trial. It can fully meet my needs.I will pay for it for long time use. Thanks for your sharing!!! Thanks for the guide, each solution to convert PDF to Word on a Mac covered in this guide is workable. Your recommendation is good, a tool that can work on any PDFs is really powerful. Super helpful. Finally someone with the answer! Thanks! I think more users will choose PDFConverterOCR because of the OCR feature, you know, if you are desk-bound, you will deal with scanned files. I have tried the PDF to Word Converter, and come here for a comment thanking you guys. It saved me the trouble about formatting, thanks. Nice post. I got several scanned pdf to convert to Word, i tried the software and amazing, thanks. I used Cisdem PDF to Word Converter with OCR to convert my scanned PDF files, it worked very well. There are many tables and images on my PDF file, this converter convert them perfectly. The only regret is that this application doesn't supports to batch convert, but so did others. When I click on the Convert button, a screen pops up asking for a "key code" before it will convert. What's the key code? Many developers provides a free trial for each users, but if you want to use those application to convert, you need to go to their website to get a key code. Useful article. Detailed steps. Using PDF to Word converter software may be a good choice. I will try Cisdem PDF to Word Converter. When the file is uploaded, it will be immediately uploaded to your Google Drive and right away opened for preview. Convert a PDF to a Word Document Step 25. PDF to word converter with OCR is so great! I had a complex scanned PDF file and I wanted to convert it to Word. This application is powerful, it retains all formats. Thanks for it. I just went to zamzar and it is NOT free and the latest reader, Adobe Feader DC does NOT save as a .docx. It saves as txt. Three ways to convert PDF to Word, and every way all are equipped with detailed steps to operate. Writer is so great!!! I used solution 2 as my PDF was OCR file. Its transition effects were great. I like it!!! Useful article, writer recommended various methods to convert PDF to Word and very detailed steps. It is great. I will try.